A black forest cake is probably the most loved flavour among the thousands available all over the world. A black forest cake is sweet, delicious and flavoursome. Not just that, but a black forest cake looks enticing. Whenever you see a black forest cake, you just want to grab it and put it into your mouth. But, do you know the history of black forest cakes? The delectable cake has an interesting story behind it. 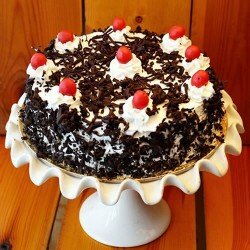 A black forest cake is a multi-layered cake made of sponge cake, whipped cream and cherries. Recent modifications also include chocolate shavings and chocolate syrup on the icing. The black forest cake originally comes from Germany. It was initially called Schwarzwälder Kirschtorte, which means BlackForest Cherry Torte or Gateau in German. The black forest cake was first made by Josef Keller in 1915. He was a pastry chef in a café named Ahrend in Bad Godesberg. He called it as “SchwarzwälderKirsch” which means “Black Forest Cherry”. As the cake was discovered in Germany, the land of the black forest, it got the name the black forest cake. Also, because the cake resembled the black forest costume that the local women wore. An authentic black forest cake has alcohol in it. Yes, you heard it right. Kirschwasser, is a clear spirit made from sour cherries which is added to the cake. Other alcohols such as rum can also be used. But in India, the cake is mainly made without alcohol content. Sugar syrup is used instead of the alcohol to soften the sponge cake and give it sweetness. Today we have many versions of the black forest cake such as black forest chocolate cake, black forest cheesecake, black forest party, black forest cherry cake and so on. The world’s largest authentic black forest cake was made by K&D Bakery. It was set up in in Europa Park, Germany. It weighed 3000 kg and was made on 16 July 2006. You can note that the fairy tales such as Hansel and Gretel, Snow White, and Rapunzel were all set in the black forest as the stories were all German. So, when you think of the cake house in the fairy tale, think of the black forest cake. The cake was so famous in Germany that word spread and it became the talk of the town in the entire Europe. Today, it is a most wanted flavour all over the world. Sour cherries are the soul of the black forest cake. They are used in between the cake layers and also as a topping. Today, the black forest cake is among the top ten cakes that is famous and loved all around the world. You can make your own version of the black forest cake by adding strawberries instead of cherries or using white chocolate instead of the dark chocolate. Isn’t this just an amazing cake with great history? Go buy black forest cake online and have a bite without fail.